My birth year puts me squarely in the Gen X camp. And I have all the claptrap to prove it. From VHS tape stacks of John Hughes movies to 12” New Order extended remixes to my beloved Brett Easton Ellis “Less than Zero” novel, you won’t mistake me for a Baby Boomer or a Millennial. Heck, I still have an old yellow SonyWalkman. Every generation thinks the next one is terrible. It’s a story as old as time. 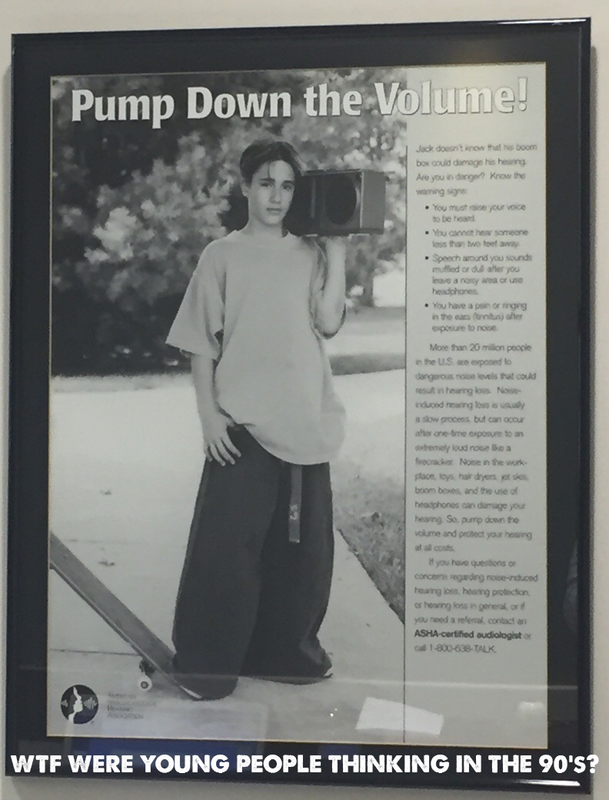 Now, in my case, it was particularly true, as the 1990s were especially atrocious when it came to music and fashion. Those terrible wide legged baggy jeans? Awful. Kind of like Disco – an era best forgotten. Now before you send me hate mail, I know my prejudice is the result of coming of age in the 1980’s. And yeah, we had our terrible stuff too. In fact, we have one particular “have-to-look-away-or-you-will-go-blind” video that makes everything the next generation produced pale in comparison. I mean, once you see this video, the argument is over and I should just shut up. And I warn you – if you are a Gen X who desires to continue to fondly look back at their younger years, don’t watch. For everyone else, click here – just don’t say I didn’t warn you. Yeah, bloody embarrassing. Us Gen X’ers have to stop saying anything bad about any other generation until we can figure a way to expunge this video from the internet. Why am I writing about Gen X and Millennials? As much as I joke about their style, I actually respect many of their decisions. In some ways, they are way wiser than any past generation at the same point in their lives. But where I differ from many market pundits is the argument that Millennials are fundamentally different than previous generations. Yeah sure, Millennials have put off having kids, buying houses and cars, and have erred on choosing experiences over things, but I don’t buy that they are some sort of completely different human being. 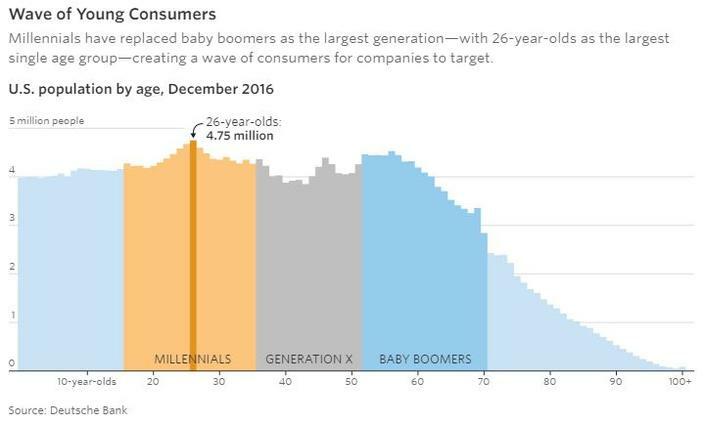 If you listen to many strategists speak, it’s as if they have written off Millennials as abandoning the usual life cycle, and will forever sit around in micro-apartments eating avocado toast while snapchatting their friends. Well, I don’t buy it. 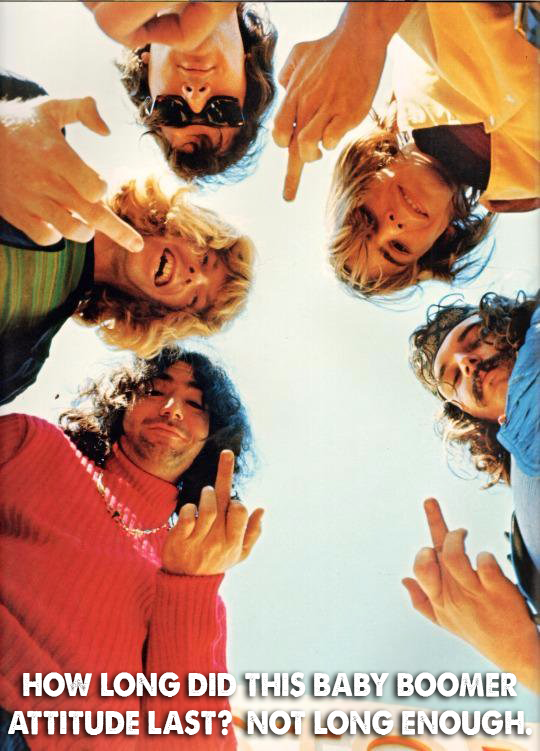 The Greatest Generation complained about their peacenik Baby Boomer flower children who seemed more interested in thumbing their nose at the establishment than being productive citizens. But how long did this rebellious attitude actually last? How long before these very same Boomers were trading in their VW Buses for BMW sedans? How long before they became the very thing they hated? And when it came to those Boomers’ kids, the same complaints rung through the air. Gen X’ers are lazy. They don’t want to have kids or families. They’re selfish. Yada yada yada. It was the same story, just a generation later. Now don’t misconstrue what I am saying. I know that Millennials are putting off having kids until later. I know they are buying fewer cars. I know they are getting married less, and later. There is no doubt these trends are real. And there is good reason for their reluctance to start families. Although some of this delay is a lifestyle choice, Millennials have suffered from the toughest economy in almost a century. They watched their parents get devastated in the 2008 Great Financial Crisis. The ensuing economic recovery has been anemic. Wages have been especially hard hit, stagnating for almost two decades. Although the trend since the 1970’s has been down, there were brief upticks for the other generations. For example for my Gen X group, the late 1990’s was spectacular. But look at the Millennials. Nothing but downticks for almost two decades. When you combine the lower wages, along with a ring-side seat to their parents’ crushing real estate crash, it’s no wonder Millennials are in no rush to buy a house and start a family. Yet this is where I differ from most other market strategists. Millennials are putting off this next life stage – not abandoning it. Human beings are human beings. Yeah sure, styles change. But ever notice how often they return? Some things are universal. As a group, the desire to procreate does not suddenly get thrown out the window. Baby Boomers surprised themselves by how quickly they went from flower children to parents, and the Millennials will be no different. And here is where it gets interesting. Do you know what is the largest age group right now? Not the retiring Baby Boomer group we hear so much about. It’s actually 26-year-olds. Stop and think about that. We have a monster bulge of home-buying-aged Millennials slithering down the demographic curve. They are already the biggest consumers out there for many items, including a lot of housing related stuff. And this is before they have even gone out and bought houses in earnest. In the coming years, Millennials will mature into prime home buying age, and there will be a huge wall of demand. There can be no denying that in the years leading up to the Great Financial Crisis, there was a large capital mis-allocation into housing in America. 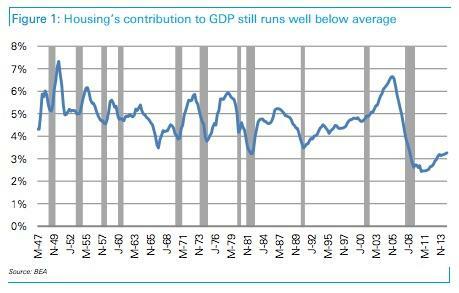 When the crisis hit, spending on housing collapsed to a 70-year low of 2.5% of GDP. Although it has since improved, it is still running way below other cycles due to pain from that real estate crash. There has been little investment in housing over the past 8 years. 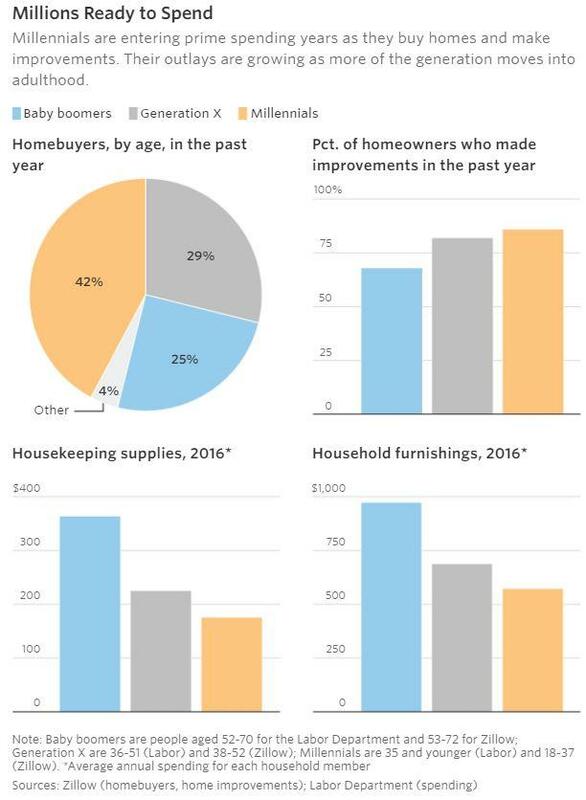 But don’t forget, not only have the Millennials put off buying houses, but they are also the largest single age group in history, at a time when home building is at a record low as a percentage of GDP.It’s a tremendous long-term opportunity to buy the homebuilders. I have been meaning to write this post up for some time. But I hesitated because I was worried that an interest rate spike would delay the homebuilding cycle. Like a mope, I have watched US homebuilders blast off without me. Ever since the summer, they have been one of the best performing stock groups. I have sat on the sidelines desperately trying to find a place to buy in. Well, the Republicans just served me up a chance to redeem myself, and I am jumping at the chance. 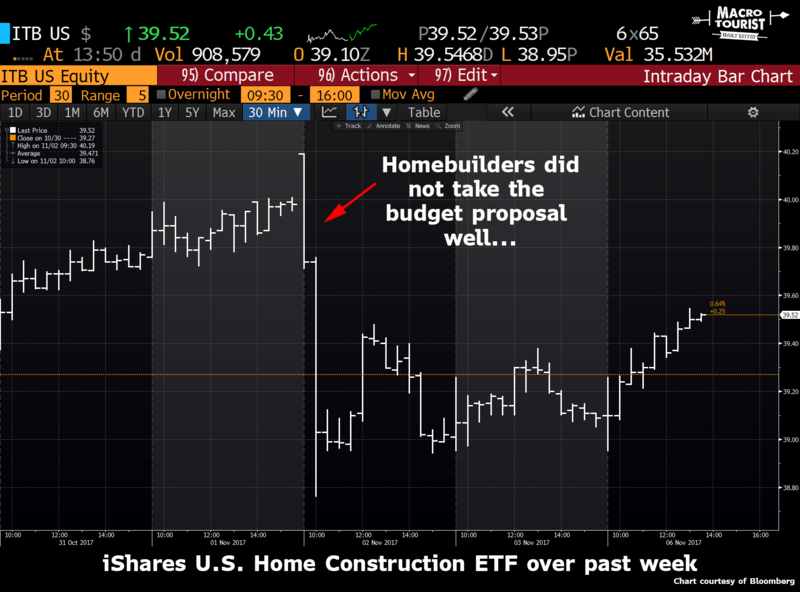 Last week, homebuilder stocks were hit on news that the proposed tax bill would eliminate the write off for mortgages over $500,000. 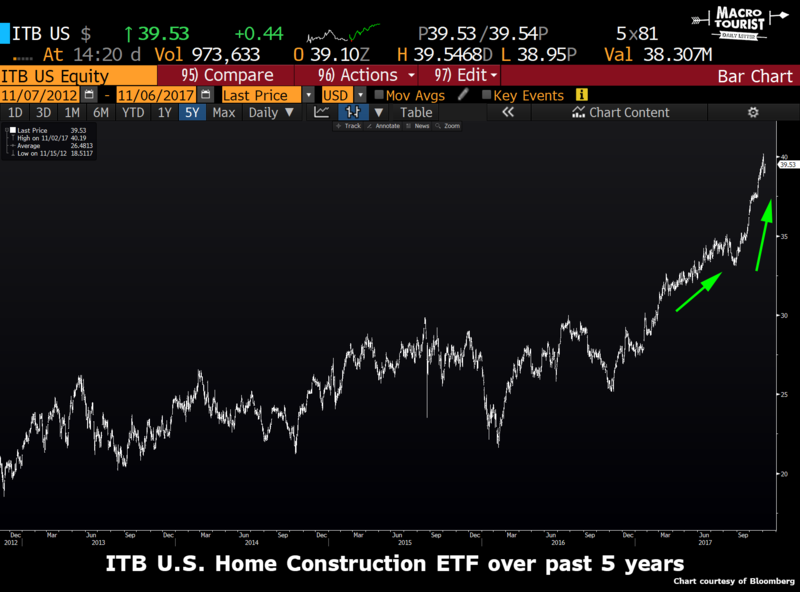 The iShares ITB U.S. Home Construction ETF was hit with a wave of selling, sending it down from over $40 to $39. I realize that in the grand scheme of things, this is far from a meaningful correction, but in today’s ripping market, this is about as good as it gets. Kind of pathetic, but a 2.5% dip is downright juicy today. Although it seems worrisome that the law regarding mortgage deductibility is becoming more stringent, the tax proposal is most likely going to be changed. The chances of it going through with this specific write-off elimination is low. The real estate lobby is one of the most powerful, and my suspicion is that law drafters included this proposal as a way to satisfy the Tea Party with a revenue neutral budget, yet will be thrown away in the negotiation phase. But even if I am wrong, the reality is that for those first time home buying Millennials, the extra $500k of tax write off will not affect them. Which brings me to an important point. I don’t necessarily think New York City or San Francisco home prices will rise. They have been rising on the back of QE for quite some time, and are now well through the 2006 highs. No, I am more optimistic that the average American will once again start buying homes. Regular Americans have been so scared, for so long. The GFC really left a mark of the psyche of the American home buyer, and it has it taken almost a decade for them to forget. While the rest of the world has seen their home prices rip upwards, American houses have languished. Here is a chart of America’s house prices versus Canada’s. 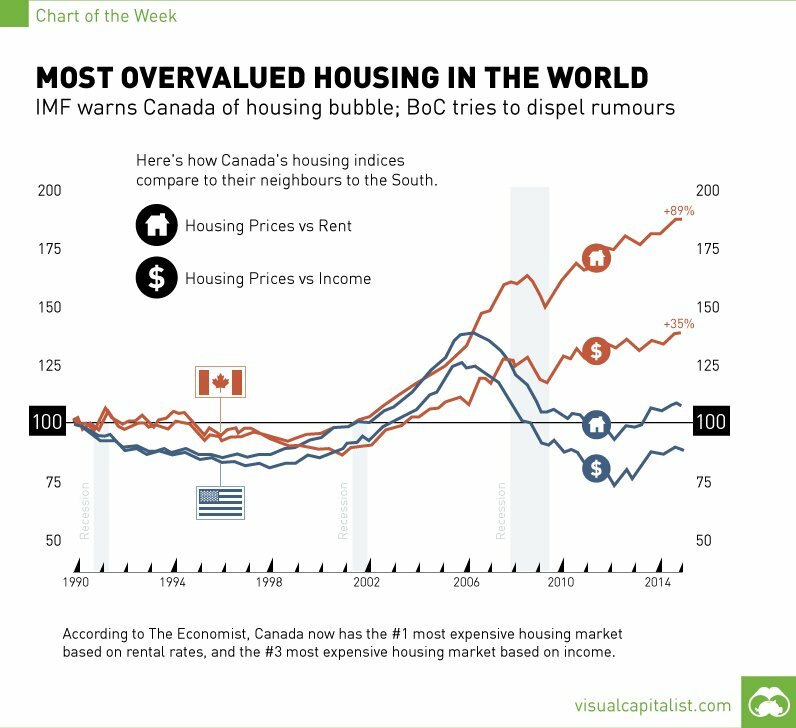 Most Americans look at the price of Canadian real estate and say, “it’s overpriced and has to come down.” And I agree. Canadian home prices are overpriced versus American equivalents. But overpriced real estate is a worldwide phenomenon. It’s the direct result of the mountains of easy money that has been pumped into the global financial system. And it’s not just real estate that is overpriced. It’s equities, fixed income, art, basically anything and everything. Why are Americans so sure the rest of world’s housing will crash? I don’t disagree that it’s expensive, but only if you mark all these other assets to proper valuations. Here is something to ponder – maybe on a relative basis, US real estate is cheap? And especially so when you remove the coastal cities where all the 1%‘ers live. Trump was elected on a populous middle America platform. Not only that, but he is a real estate guy. If there was ever a no-brainer move for him, it would be to get mid-America real estate humming again. If I were picking which homebuilders to buy, I would avoid the high-end builders, and instead focus on the lower-end ones that service America’s heartland. Some of you might worry that I am too late. The ITB ETF has run a long way over the past six months. 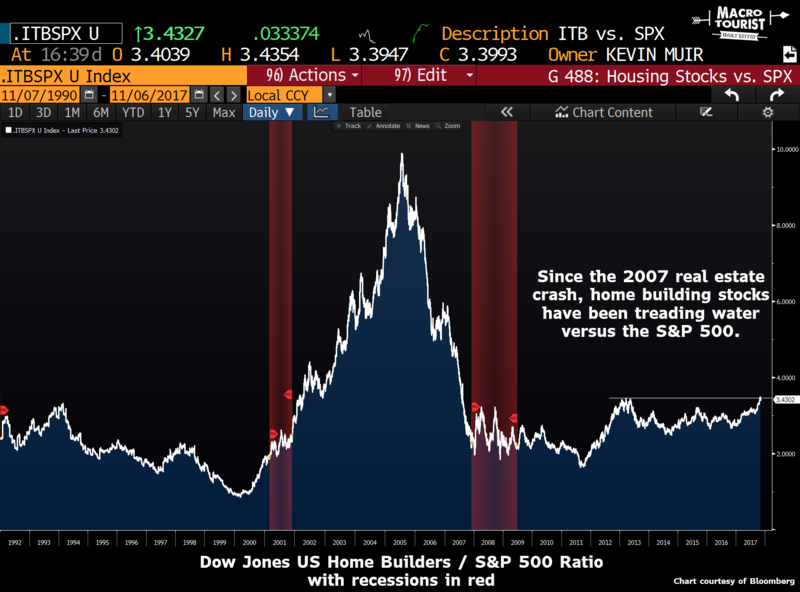 But when you compare the Dow Jones Home Builders Index to the S&P 500, it becomes immediately clear that homebuilders have been treading water ever since the 2007 real estate crash. This rally of the past few months has just bumped up against the previous relative high of 2012. Now I don’t expect the same sort of 2004-2006 madness, but I could easily see homebuilders continue to outperform in the coming years. Especially when you consider they are more interest rate sensitive, and if we do slide into a recession, given the 2001 experience, the builders might be an especially great place to hide. I know many of you will push back and say real estate is too expensive. Well, what isn’t expensive? Are bonds cheap? What about stocks? 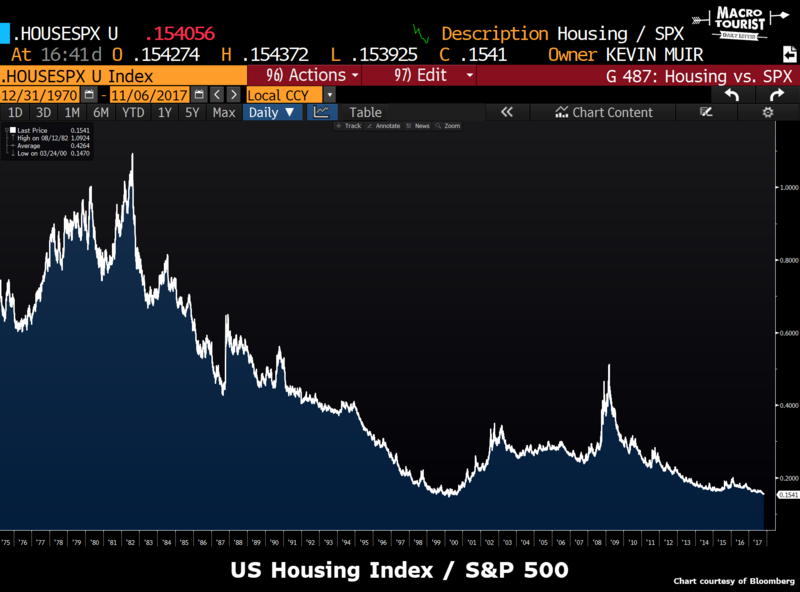 This isn’t a fair comparison because stocks are a wealth creating assets while housing is a depreciating one, but have a look at this chart of the US Housing Index versus the S&P 500. We are back down at the lows last seen in 1999. Coincidence? Apart from their obsession with taking pictures of their food, I like the millennials. I have tossed out my 12” new wave records and walkman for an iPhone and a spotify subscription. I can honestly say, the millennials have it much better than I ever did. Heck, some of their hipster musicians have even rubbed off on me. 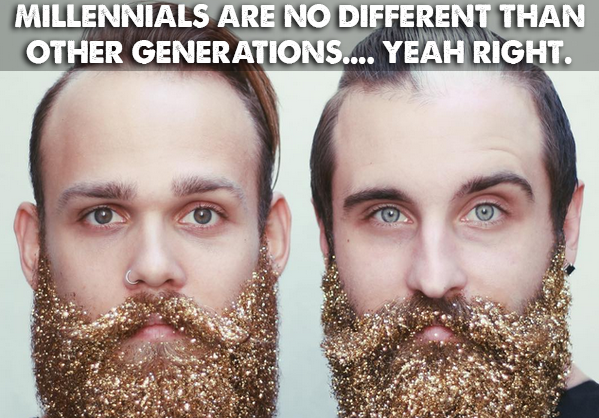 But don’t fall for the argument that the millennials are so different than all the previous generations.Every generation has been called different, and ultimately, they are all the same. They will buy houses and do what every other generation has done. The demographic bulge of 26-year-olds is coming into prime home buying age at a time when there is precious little supply. And just imagine what would happen if the Phillips Curve finally kicks in with a little bit of wage inflation. It’s a terrific setup for a long-term bull market in homebuilders. Although they have run, they are still cheap when compared to the rip roaring stock market. I am not adding to stocks up here, but think homebuilders offer a great switch from those high-flying tech names.